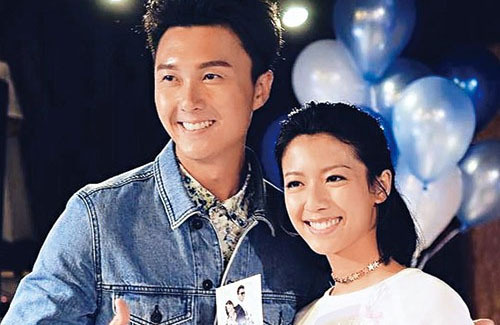 Vincent Wong (王浩信) is Hong Kong’s latest idol to hit the mainstream scene, but the 34-year-old was never single for his fans. The Over Run Over <EU超時任務> star married fellow 36-year-old TVB actress Yoyo Chen (陳自瑤) in 2011, and together the couple have a five-year-old daughter. The tabloids haven’t been easy on Vincent. A source said that Vincent’s new fame has allegedly put a toll on his relationship with Yoyo, pushing the couple to consider divorce. The source says the couple are now living separately. Besides Yoyo, Vincent has been linked with several actresses. Last year, while filming Legal Mavericks <踩過界> with Sisley Choi (蔡思貝), paparazzi spotted Vincent and Sisley eating hotpot together in a “locked” VIP room. However, Vincent clarified at an event on September 30 that he didn’t eat with Sisley alone, as they were with their fellow cast members. “I wouldn’t do such a thing to hurt [my image]!” said Vincent in regard to his cheating rumors with Sisley. Regardless, it does appear that Vincent and Sisley are quite close. A few nights ago, a tabloid magazine spotted Vincent dropping by Sisley’s home in North Point. He parked his car inside a garage and did not leave the facility until two hours later. A few nights ago, a tabloid magazine spotted Vincent dropping by Sisley’s home in North Point. Sisley is such a gossip queen. I know it isn’t her fault. But if this is true, I hope both of them will settle their problems before doing much much more. Especially for sisley. Her career won’t survive this scandal. Vincent will survive because asian community blames women more. i hope these rumor aren’t true. i hope Vincent is a devoted husband lol. cheater or not, “i wouldnt do such things to hurt my image” when this is the first thing to come up in his mind to say then it tells me that he loves his image more than his wife. The tabloids really don’t like Sisley, do they. It’s like they target her whenever possible. Likewise with Vincent and Yoyo’s marriage… As if they want to see it fail… so sad! Poor Vincent & Sisley. Those HK paps really don’t leave you alone once you’re in the spotlight. Let’s just hope this won’t affect Vincent & Yoyo’s relationship. Besides, I think Yoyo is like a thousand times hotter than a lot of the young actresses in TVB nowadays. I don’t think Vincent will be distracted by any of them when he has such a hot wife at home. @iciel wake up and smell the coffee. You are an adult I assume. I am not saying Vincent is cheating. However, if you are thinking that a ‘hot’ woman will keep a man from cheating, you are so sadly mistaken. Look at Princess Diana, compared to Camilla. Did that keep Charles at home?. Again, I am just making a general comment. Not accusing Vincent of cheating. @Kuks, the tabloids can make or break you, and they can be very ruthless. However, it is part Sisley’s fault for having this latest gossip spread. She knows that there is gossip out there about her and Vincent, why add fuel to the fire?. She had no business letting him into her home unless other friends or coworkers were there. I know some of you will say she is an adult and she can let whoever she wants into her home, but sometimes one has to bite the bullet and do the common sense thing, which means avoiding situations that will fuel the rumors.